Saturday was the start of my Dr. Dog Internship, only Dad and Mom had to attend the first session, so I stayed at home for a long morning nap. 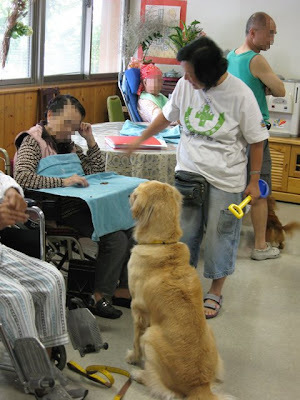 It was held in a room at a hospital ward for the elderly patients. The session was led by Harley's Family and they brought four of their Dr. Dogs to service that day. 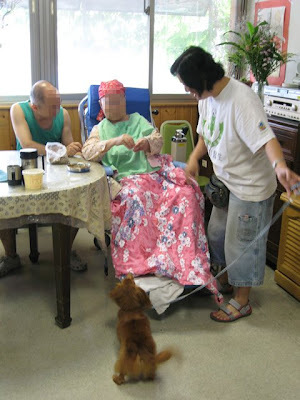 Harley's mom gave us some tips and showed us what a typical session would be like and demonstrated her skills to coax the patients to the waiting room. 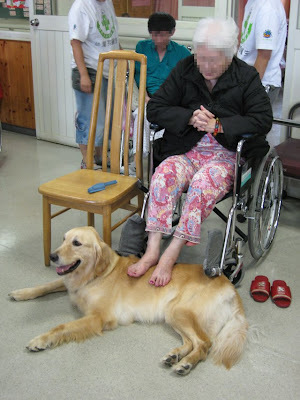 It was definitely not an easy task getting the patients out of their bed. Some of the patients were excited to play with the Dr. 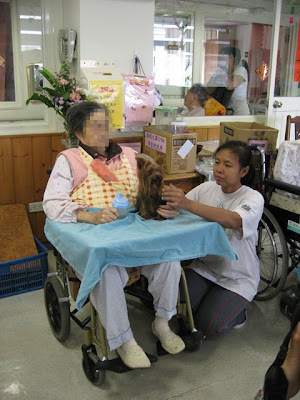 Dogs, while others preferred to watch or sleep on their wheelchairs. 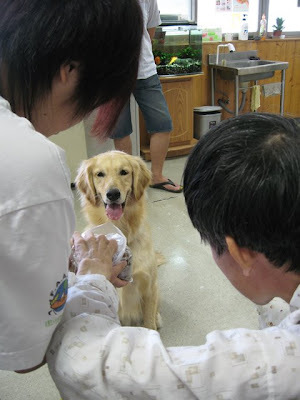 Here is Hadi (哈帝) waiting for a treat. 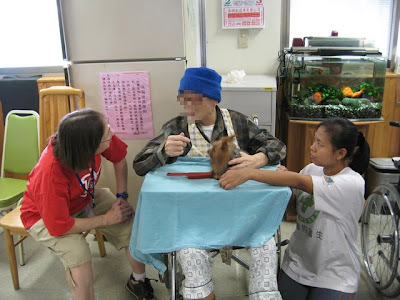 This grandpa was all quiet in the beginning, but warmed up after one of the volunteers spoke to him in English. 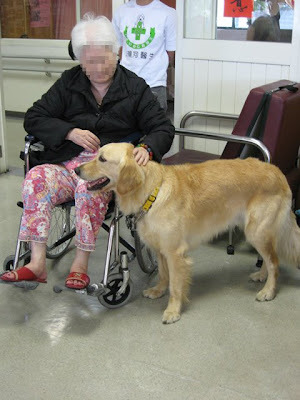 This grandma would not speak a word, but she didn't mind Ha Yue ( 哈悅) near her. 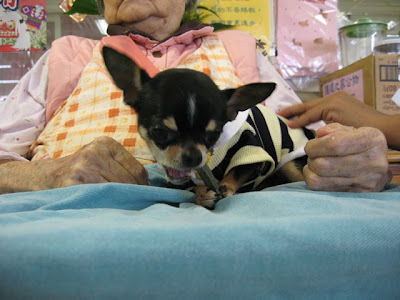 Hala ( 哈拉) chewed on a dental bone near Grandma. 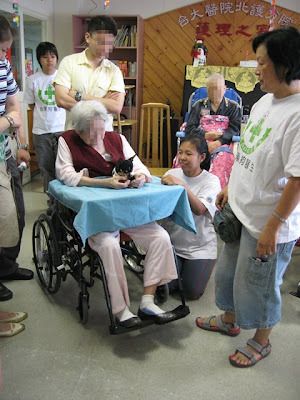 Ha Bao ( 哈寶) got some pets while grandpa chatted with one of the volunteers. Ha Di enjoyed staying under the wheelchair. Grandpa exercised his hands by giving Hadi a hair brush. Grandma learned to give commands to Hadi. Hadi waited patiently for some treats. Grandma gave the Down command and used a spade to feed Hadi. 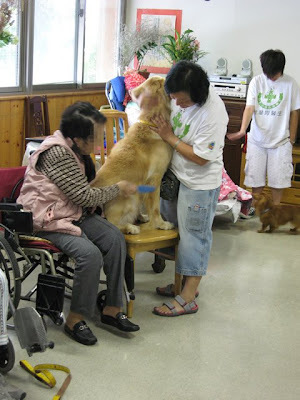 Hadi sat on a chair so that Grandma could easily brush him. Grandma enjoyed cuddling Ha La ( 哈拉). Ha Bao tried to catch the treats that Grandma threw. 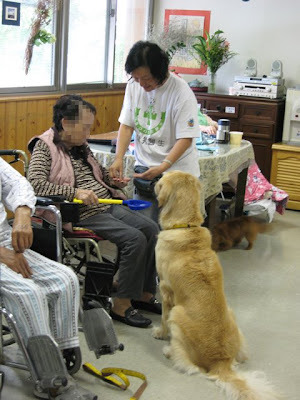 This granny was afraid of big dogs, but slowly warmed up to Hadi. She gave him a nice massage too! Hadi rested under the table during the debriefing session. 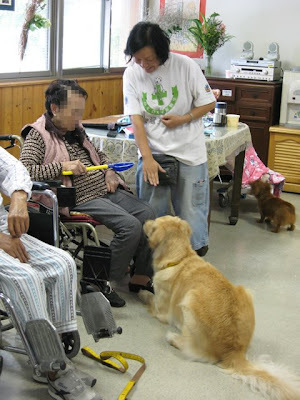 Overall, the visit was quite an eye opener as we got to witness how some of the patients who were not so receptive to dogs initially, slowly warmed up to them. Also, a few who were quiet in the beginning started to become more talkative. It was also a great session for the patients to interact with the volunteers and do some hand and leg movements with the help of our Dr. Dogs. 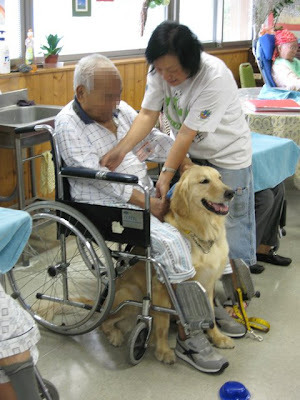 The comfort and smiles that they bring to the patients are just priceless! I am definitely looking forward to attending the next session and I hope Grandpas and Grandmas will enjoy being with me. hello dino and all at home! Hey lil' pups!!! Good to hear from you again! When are you visiting me again? That is a clear example that we can work wonders with people! Aww, what a sweet post this is! I know you will be a very nice & patient doggy like Hadi & the rest. 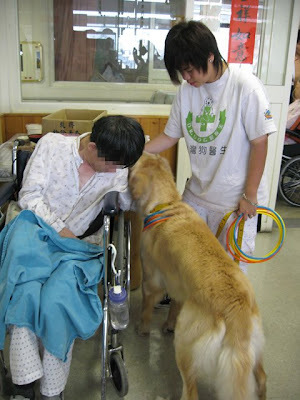 I remember one time when we went to a Disabled people's home. Some of the old & young people there were mentally challenged but I tell you, they were the MOST bootiful people I've ever met! Usually I will not like people touching me that much especially strangers. I don't snap I just move away coz I'm not amused. But that night, I accepted. And a mentally challenged boy around 15 years old, took me for a walk & Mommy didn't follow us along coz she said she was confident that this boy could handle me. I usually pull like crazy when I go for a walk but that night, I did not pull him at all. I walked calmly but ahead of him but NEVER pulled a single time! Mommy was so proud of me & the boy smiled handling me. He was one of the quietest & shyest person there. He never wanted his picture taken too & that's why Mommy never took. He adored me & the other dogs that night. I was a good girl!!! I wanna visit the again! Hi Amber, thank you so much for sharing your experience with me. I am sure they miss you a lot and I hope you have a chance to visit them again soon. 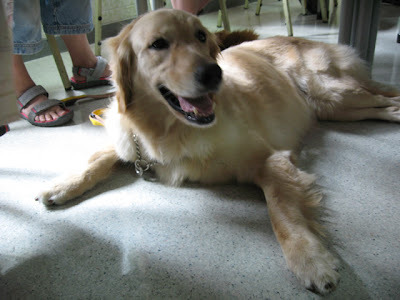 Besides dancing, I think you make a good therapy dog too! Looking forward to the first service of Dr. Dino in the near future. Hi Buggy's Mom, thanks so much for your support!